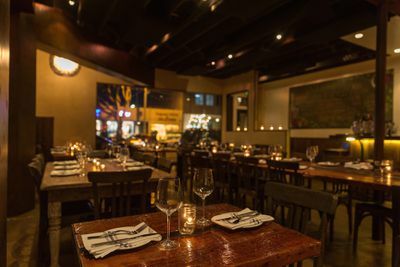 Great news for Santa Monica, as the shuttered Fork in the Road has returned to life following a kitchen fire that destroyed a chunk of the restaurant back in 2015. The official reopening date is scheduled for December 10. Last year, an afternoon blaze kicked up in the walls behind the stove at Fork in the Road, prompting firefighters to shut down Main Street while they pulled the roof off to contain the blaze. Undeterred, owners Tom Elliott and Spoon Singh stepped up to use the accident as a way to refresh the entire place, giving the restaurant a hip, dim vibe. Now the 62-seat space is back and more beautiful than ever, with a strong Cal-Med menu from chef Marco Manca. That means pork belly flatbreads, roasted octopus, duck leg confit, and plenty of wine and cocktails for all to enjoy. As of December 10, Fork in the Road will resume dinner hours from 5:30 p.m. to 10 p.m. Sunday and Tuesday through Thursday, with an extension to 11 p.m. on Friday and Saturday.